Earth Hour 2012 made famous landmarks from all around the world, which normally light up the night sky, to plunge into darkness today to raise the profile of climate change. 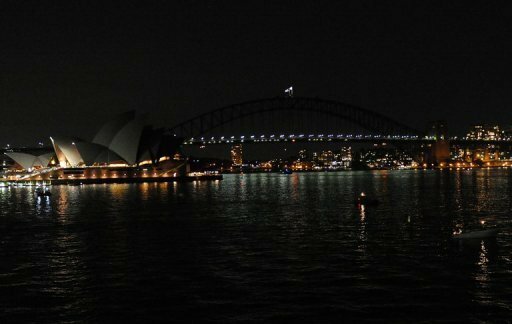 Sydney’s iconic Harbor Bridge and Opera House were among the first buildings around the world to begin the blackout. Later on Washington’s National Cathedral, London’s Clock Tower, the Great Wall of China and Tokyo Tower will also be dimmed at 8:30 p.m. local time. Central Sydney icons have been taking part in the annual event since Earth Hour began as a Sydney-only event in 2007. Australia is among the first countries to hit the light switches each year. In New Zealand, Sky Tower in Auckland and parliament buildings in Wellington switched off two hours earlier. The small island nation of Samoa was the first to switch off the lights. The Faleolo International Airport went dark as the community came together to launch a number of local green activities for the year ahead. People in Fiji also switched off their lights where possible despite the devastating floods. World Wide Fund for Nature (WWF), the Washington-based environmental group that organizes the event, said the number of countries and territories participating had grown from 135 last year to 147 this year. Organizers say businesses and residents in 6,400 towns and cities are taking part. Libya, Algeria, Bhutan and French Guinea are among those participating for the first time. UN Secretary General, Ban Ki-moon said: “Turning off our lights is a symbol of our commitment to sustainable energy for all.